Klarman Hall's inspiration is the business school 'case study room' – seating 80 to 100 – that is here explored in a room of ten times that size. 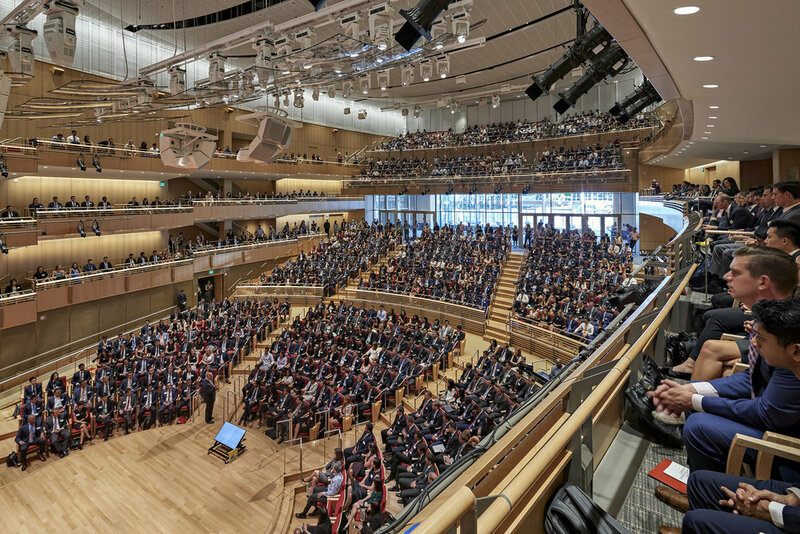 It is a room of presidential pedigree and profound acoustic challenges: its tall volume has much more in common with a concert hall than a lecture room; its acoustically-focusing, 60-foot-wide LED display faces a tall glass wall at the rear of the hall; and, for good measure, the School's mandate that the 600 people in the lower volume be able to converse spontaneously without handheld microphones. In response, visually refined absorption and diffusion tame the tall volume while painstakingly modelled side walls and canopy deliver support and clarity uncommon for a room of this size. The architectural acoustics work seamlessly with three sophisticated audio systems (designed by our collaborators at Idibri) that subtly lift voices, conveying ample support to those with something to say.